So, the verdict: They were absolutely lovely! I got praises and requests about the recipe from the group, they were a total hit! I loved their moistness, but without that greasy feeling. And they´re just sweet enough, without leaving you with a feeling of going into a sugar-coma. And – believe it or not – I actually didn´t miss the frosting! I did put some butter on, just to try it out, but I guess that´s just me. I butter everything! But there was really no need to. I did cut back a little on the oil and sugar, which wasn´t a problem, and next time I´ll try to substitute some of the flour with whole wheat too. And, before you dig in, I have to say: let them cool. It´ll be worth it. The flavour intensifies and they become so much better! 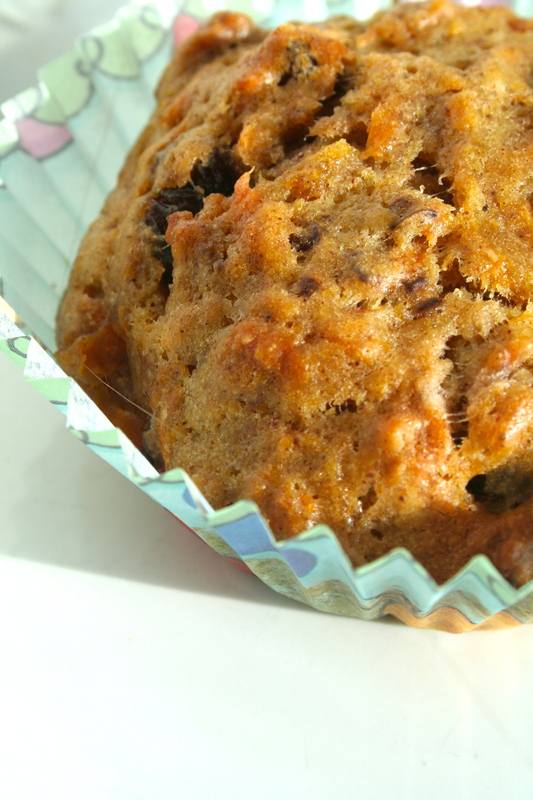 And I loved the different textures provided by the carrots, raisins and walnuts. I didn´t have coconut, so I left that out, but I guess that would be a nice addition texture- and taste-wise! I´ve actually never tried coconut in carrot cake, so I guess it´s time to face that fear! Next time. Because there will certainly be a next time with these! Getting Ready: Center a rack in the oven and preheat the oven to 375 degrees F. Butter or spray the 12 molds in a regular-size muffin pan or fit the molds with paper muffin cups. 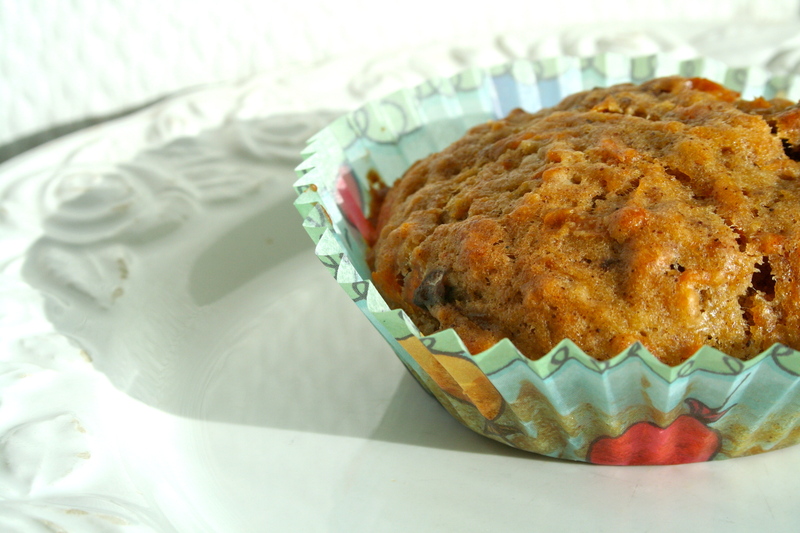 Alternatively, use a silicone muffin pans, which needs neither greasing nor paper cups. Place the muffin pan on a baking sheet. In a large bowl, whisk together the flour, sugar, baking powder, cinnamon, ginger, baking soda, and salt. Stir in the brown sugar, making certain there are no lumps. In a large glass measuring cup or another bowl, whisk the oil, eggs, milk, and vanilla extract together until well combined. Pour the liquid ingredients over the dry ingredients and, with the whisk or a rubber spatula, gently but quickly stir to blend. Don’t worry about being thorough – a few lumps are better than over-mixing the batter. Stir in the carrots, coconut, currants, and nuts. Divide the batter evenly among the muffin cups. 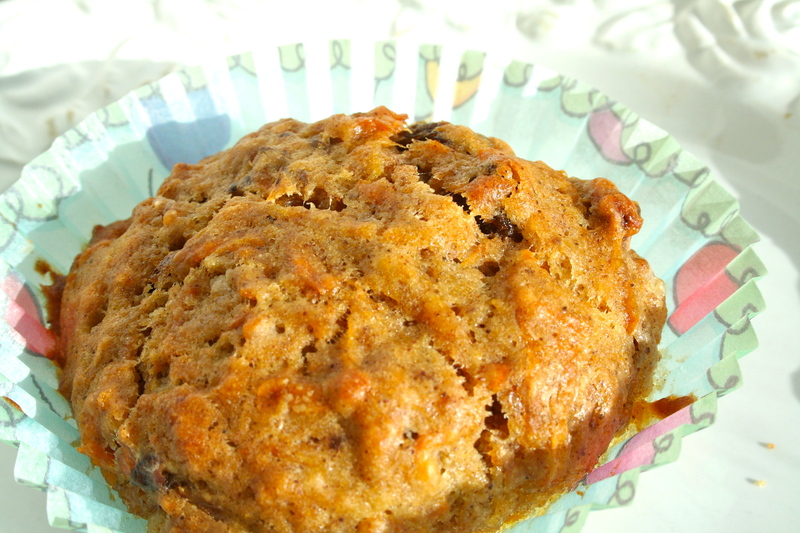 Bake for about 20 minutes, or until a thin knife inserted in the center of the muffins comes out clean. 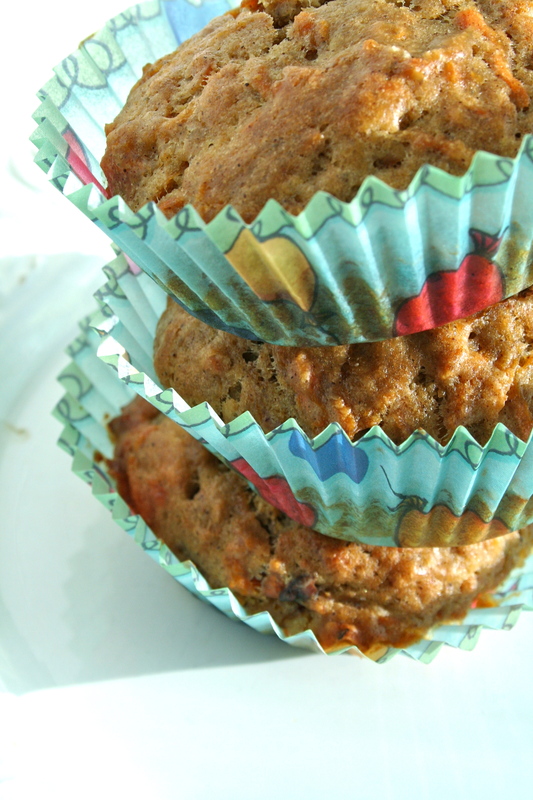 Transfer the pan to a rack and cool for 5 minutes before carefully removing each muffin from its mold. Or just leave them the way they are!